Image recognition meets advertising. That is Snapchat’s idea with a new patent that would use image recognition to serve ads, coupons, or filters specific to the content in a photo. 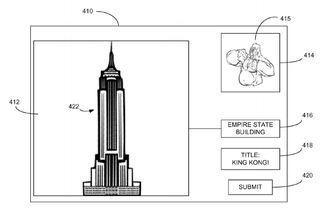 The above illustration from the patent filing uses the example of the Empire State Building, possibly the most photographed building in North America. In this scenario, Snapchat suggests it could recognize the Empire State Building and immediately suggest a King Kong filter and title. The filter itself could even be animated. But Snapchat has more in mind than just a new automated filter feature. The app could also analyze the photo of a cup of coffee, geolocate the snap, and offer you ads or coupons based on your location. If it could recognize a certain restaurant, it could even provide a menu as a filter. The patent also shows that certain companies could bid for certain objects, like Dunkin’ Donuts and Starbucks getting into a bidding war over coffee-related ad placement. As Business Insider suggests, applying ads to images is essentially what Google has done when it comes to text-based information through keyword searches. Snapchat has also heavily invested in ad technology in 2016. In June, Snapchat announced its ad API meaning ads on the platform could now be sold by third parties. Snapchat also offers geofilters, which lets users (for free) and brands (for $$$) create specific filters for events and locations within a geofenced area. Snapchat’s patent would be a smarter and more powerful approach to advertising through filters. Snapchat is obviously not the only company interested in making money off its huge trove of photos and associated data—Facebook and Google have both been ramping up their photo-identification AI with exactly this end game in mind. And it’s no surprise that marketers see a broader potential for the technology if the information contained within images could be used to target specific ads or recognize brand logos within photos. Of course, patents are patents. We can’t say with any certainly that Snapchat will stick with this idea. But considering most of its newest features like Live Stories, the Discover section, and sponsored filters all work toward generating ad revenue, taking advantage of Snapchat’s most valuable resource seems like the next logical step.